EasyWater Softeners Prevent Hard Water Minerals From Clinging to Your Pipes. EasyWater Softener is the salt-free alternative to the conventional water softener. This product has a one-of-a-kind approach which targets mineral deposits forming inside your plumbing system. 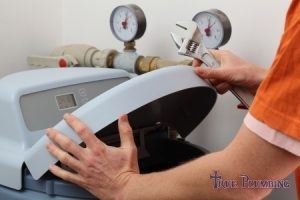 True Plumbing is happy to offer EasyWater Softener installation in Fort Worth, TX and the surrounding area. If you interested in learning more about this water treatment solution, give our team a call at 817-542-1980. Our pros are here to answer any questions or concerns that you may have. Some may debate whether or not EasyWater Softeners are as effective as the traditional option. However, these products are trusted by countless homeowners and business owners in the local community. Below are the specifications of each model. Hard Water Minerals Can Cause a Reduction in Water Flow For Your Shower. As many homeowners know, salt deposits can prove to be a bit harsh on plumbing, water-using appliances, as well as our clothing in the washer. By using a salt-free softener, you’ll enjoy an extended product life span and not have to worry about constant repair and maintenance that may come along with a conventional water softener. With an EasyWater Softener, you can also look forward to enhanced efficiency from your water appliances. Studies have shown shower heads that use hard water actually lose as much as 75 percent of their flow within 18 months compared to softened water, which maintained its full flow. We recommend doing your own personal research on EasyWater Softeners. The salt-free option would be a better fit for some than others. Our team at True Plumbing is here to answer all of your questions and concerns that you may have. We’ll even come out to your home and help to determine whether or not this would be the ideal option for you. So feel free to give us a call at 817-542-1980 for your EasyWater Softener installation in Fort Worth, TX. Updated on August 10, 2018 at 11:04 am by True Plumbing.